Make the most of your transit stopover at any of Moscow airports. Even if you have just a handful of hours, let us take you on a stunning tour of Moscow and get you back in time for your next flight. Our tour guide and translator will meet you right at the airport. You can pre-arrange the mode of your transport as well as the iconic sights you want to see. The best way to plan a tour during your transit stay is to cover all the iconic landmarks of the city. These include the well-recognized Red Square which is the heart of Moscow and is home to famous architectural wonders such as the St. Basil’s Cathedral, the Kremlin and the famous GUM shopping mall, Alexander Garden, Bolshoi and of course we will get down to the wonderful Moscow Metro. You can also choose to see the beautiful Gorky Park and a glimpse of the huge Olimpic Luzhniky Stadium. If you want a more peaceful transit tour, you can take it easy along the Krymskaya embankment or take a trip to the Sparrow Hills to enjoy the highest vantage point of the city. We will tailor the transit tour exactly as per your preferences and taste. 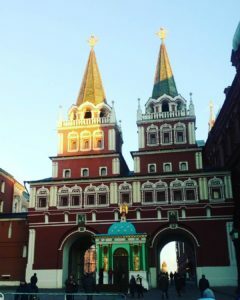 Tell us the duration of your transit and the iconic landmarks you want to see; alternatively, let our highly experienced guide take you to the most famous Moscow spots. At the end of this memorable tour, we will drop you right back at the airport just in time for your next flight.